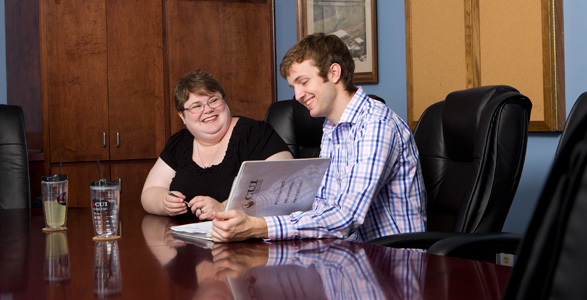 The Human Resources track of Business Administration is recognized by the Society for Human Resource Management. For Christians, business is more than just a way to earn a living; it’s a calling. That’s why at BJU you’ll learn to be business savvy—because good business not only benefits you, but also honors God. Our business administration program will equip you with the biblical foundation you need to excel in business as you explore various topics, including how personal integrity is the root of good business and how business ethics stem from the Word of God. Additionally, you’ll learn how to steward resources wisely and responsibly, and you’ll improve your skills in communicating and interacting with co-workers and clients. We make sure you understand the basics of economics and business law in the United States and provide you the option of pursuing international business. Through everything, we aim to equip you with the knowledge of how to glorify God and lead at work and in your family, church and community. BJU’s business program equips you in the basics of business theory within a biblical worldview so that you can master the concepts and practices of business. Many of your courses include case studies that will expose you to a wide variety of real world situations and give you the opportunities to analyze them through the lens of Scripture. We also bring in business graduates periodically to speak in our classes and share their insights into current trends and markets, so that you can get a broader understanding of your field. We recently redesigned this program so that you can personalize your program with courses that fit the career you’re looking for. Choose from courses in management, marketing, finance and human resources. And if you’re preparing for other fields such as graphic design or church planting, a business minor is a great fit for your future. BJU’s business program provides you hands-on experiences as well. You’ll work through some of the same commercial business simulations that Fortune 500 firms use to teach and assess essential business knowledge and skills. And through internships in local, regional and national firms, you’ll get a firsthand look at the inner workings of the business world so that you can prepare for what God has in store for your life. In the business world, the ability to adapt to change is essential to success. The BJU Core equips you to thrive in any job situation and to be knowledgeable in subjects like art, history and science so that you can build common ground with future contacts. And with the Bible courses, you’ll learn how to apply truth to your life and business practices. At the same time, these classes will help you adapt to speaking situations, strengthen your rapport with others and more effectively communicate your testimony for Christ. Many of our students find that courses in language, graphic design or history are most helpful in preparing them for their careers in business. If you’re unsure of what electives would be best for you, our business faculty are happy to meet with you to find out what would supplement your business degree best. A focus on finance prepares you for managing the finances of companies and individuals through investments in inventory, fixed assets and financial assets. In addition, you’ll learn how companies raise, invest and earn capital in a variety of financial markets. The program will qualify you for entry-level positions in a wide variety of business disciplines, teach you how new businesses are created, and give you the basics on managing corporate finance departments, financial institutions (e.g., banks, brokerage firms) and financial services (e.g., financial planning). A focus on human resource management gives you a foundational understanding of business and prepares you for specific positions in human resources. The program covers a wide range of skills, including training and development, recruiting, compensation and benefits, employee relations, leadership, communication, and decision-making. The program prepares you for further business or graduate studies. The human resources management track is recognized by the Society for Human Resource Management. A focus in marketing prepares you to work in or manage marketing at the local, national or international level. You’ll learn the basics so that you’ll be ready for entry-level positions in sales, retailing or market research, or even for establishing and operating your own business. Additionally, you’ll have the knowledge and skills necessary for advancement in a corporate structure. I’m so thankful for the experience I had in the School of Business at Bob Jones University. My interaction with the teachers and the opportunity I had to participate in a summer internship was invaluable. Involvement in the community is an important part of the BJU experience. Many of our accounting students take part in a variety of outreach opportunities, including the Community Service Council (CSC). The CSC is a student-led, student-driven organization that connects students with local businesses and communities. The CSC oversees events such as cleaning up the Greenville Zoo and local parks, sponsoring an on-campus blood drive, and collecting funds for the Heart Fund or other charitable organizations. Each fall, BJU’s Student Legislature team travels to Columbia, S.C., to join with students from 10 to 15 other major colleges and universities in the state. Together they form a house and senate, presided over by officers elected from among their members. You can use your extemporaneous speaking abilities, persuasive powers and knowledge of current events to pass legislation that you have written. BJU’s business faculty members have experience in a variety of fields and businesses, including Fortune 500 companies and non-profit organizations. All have MBAs, terminal degrees or professional certifications, and many have experience in regionally or internationally accredited firms. Apply finance concepts and analysis to the role of finance across functional areas of business. Integrate marketing concepts in business operations and incorporate effective marketing strategies in making sound business decisions. Lead and motivate employees to coordinate production and meet strategic goals. Compose professional quality business documents, and prepare and deliver professional presentations on business topics. Synthesize the totality of their business education by analyzing and formulating business strategies, business position and its long-term direction, resources and competitive capabilities for implementing strategies formulated, and measuring the success of implemented strategies with a biblical worldview. Define and explain complex financial problems or challenges in diverse business settings and cultures. Apply financial business knowledge and skills to real-world problems in local, national, and international markets. Apply human resources theory and practice to the working environment. Operate training and development programs to foster employee and organizational learning and development. Apply brand and marketing management theory to selling and integrated marketing communication. Create appropriate marketing strategies and tactics for domestic, global business and consumer markets.